It was a great trip to Cincinnati, but I am home at last and I’ve got to admit that it’s nice to be in Florida again. I love Cincinnati, but Florida, with her beaches and my good friends, has become my home. 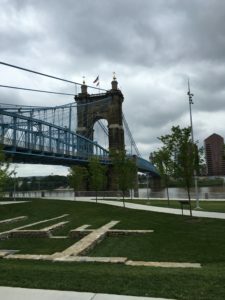 But that doesn’t mean that I didn’t have some fun in Cincinnati and take some more pictures of the place the boys from the Unbreakable Bonds series call home. Sadly, it rained a lot while I was in town, so I didn’t get to take quite as many pictures as I would have liked or visited all the places that I wanted to, but we made a nice dent in my to-do list. It just means that I’ll have to make another trip back soon. I will admit that one of the places at the top of my list was The Ascent. 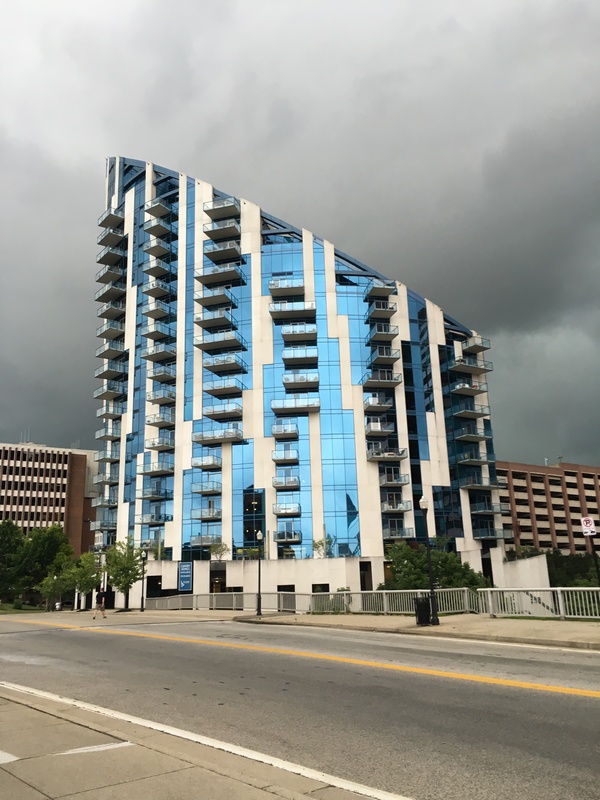 This unique skyscraper located just across the Ohio River in Northern Kentucky is eye-catching in its design and looks a little out of place when set against the other brown and red brick buildings, but I love it. 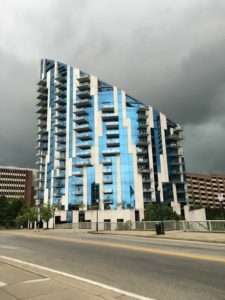 But the most important thing to me is who lives in that building. We spent a lot of time in the penthouse at the pinnacle of the Ascent getting to know Lucas and Andrei in Shiver. We spent even more time in Shatter at the Ascent when Snow was forced to crash with his friend. As Rinda and I work on Torch, we find ourselves drifting back to the penthouse for more gatherings, planning and laughter. The Ascent has become a central location for the Unbreakable Boys and I’m so glad that it feels like a home for all of them. 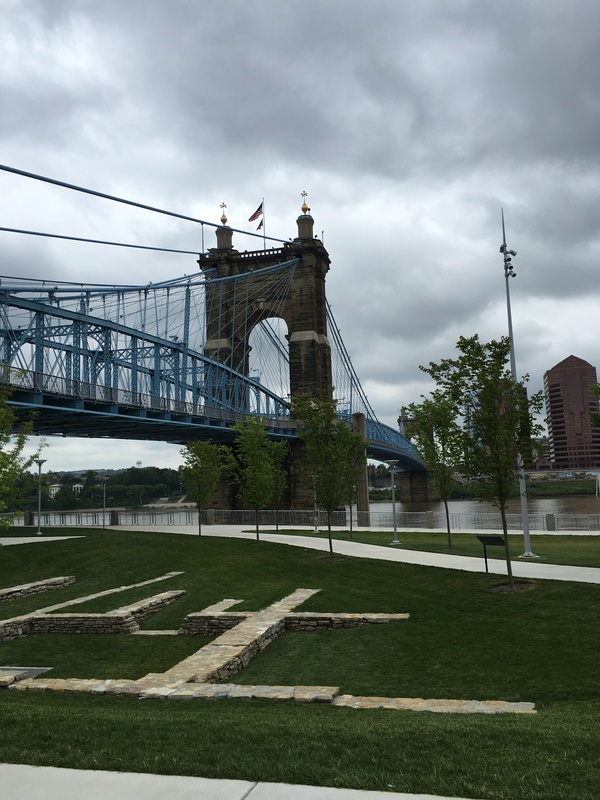 Since we’re down by the river with the Ascent, let’s just stroll across the Suspension Bridge to Smale Park. It’ll give us a great view of the bridge and the downtown area. 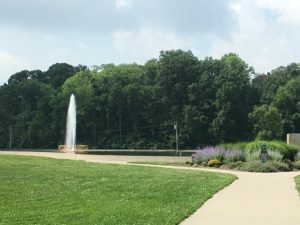 This park is a newly renovated area that was formerly used as just a parking lot for tailgaters ahead of the Cincinnati Bengals football games. But the city scratched together some money, completed some amazing landscape, and activity areas for children. There’s an amazing foot piano and a flying pig to climb on. There’s a giant checkers and chess set to play with. And so many fun water features to play in to help cool off on a hot day. My husband and I strolled through the park for a bit and sat on one of the swings to watch the river just quietly flow by. Unfortunately, as you can tell from the pictures that day, a massive storm was moving in so we didn’t get to linger long. We actually just managed to get to the car when the sky opened up and dumped considerable rain on the city. Sweeping up from the river into Mount Adams – which is also home to Ian – we come to Eden Park. If you’ve read Shiver, you’ve heard of this park. It’s one of my favorites. Eden Park hold the Cincinnati Art Museum, which is where Lucas and Andrei attended that little party that led to the car chase. Yep, that park. At one point, Lucas looks out the window and sees the golden glow of a fountain through the trees. This is that fountain. I didn’t get the chance to get up the Art Museum, but we did wander around Eden Park. I believe the man-made lake is called Mirror Lake. During the winter, when it gets extremely cold and the water freezes, people will come to the park to ice skate on the lake. At the other part of this green area is a big gazebo. I’ve seen lots of wedding pictures taken over the years in this park and at this gazebo. 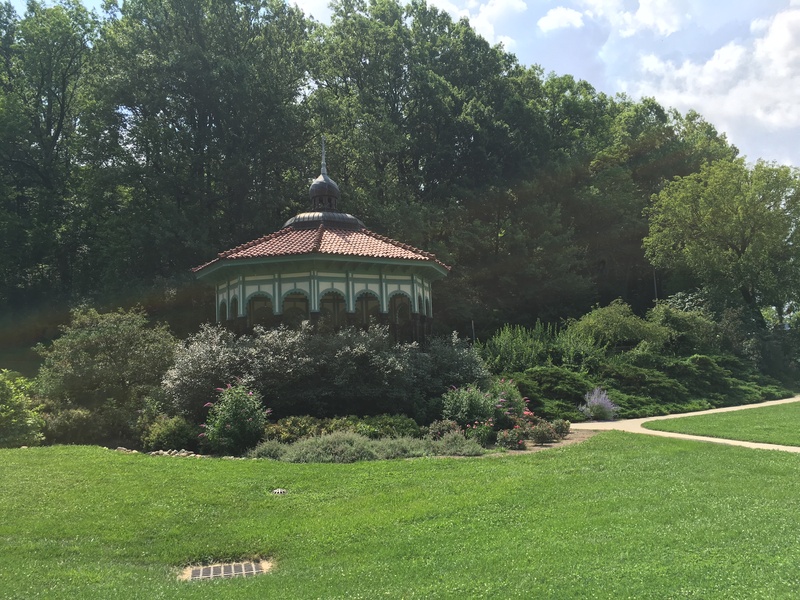 During the summer when I lived in Cincinnati, I would come for long walks in this park. Or I was just drag a blanket and a book, and lay out in the sun and read a book like so many of the other citizens on a lazy Saturday afternoon. I’d love to find an excuse to bring the boys back to this park that didn’t include car chases or life-and-death scenarios. 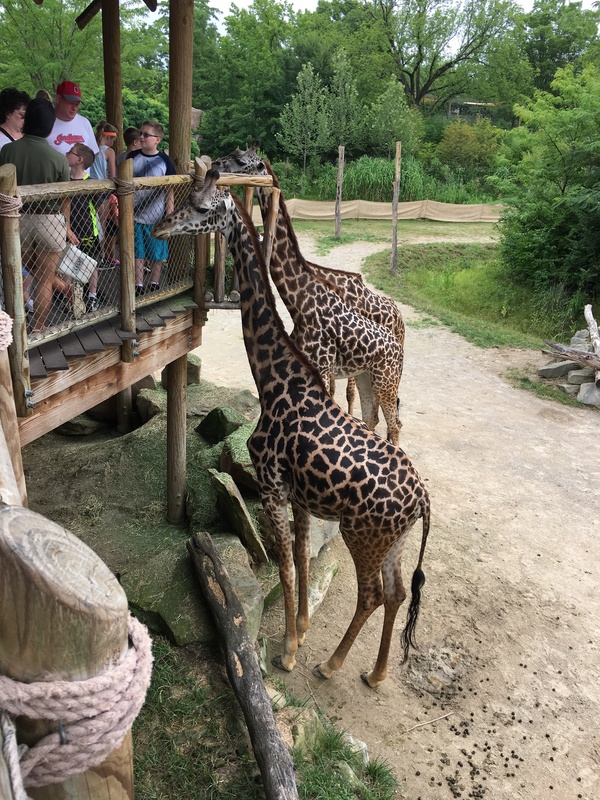 We managed to get to the Cincinnati Zoo while we were in town. 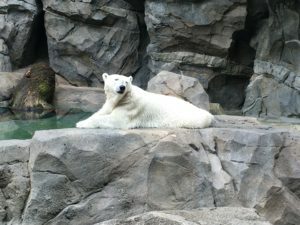 The Cincinnati Zoo is one of the top rated zoos in the United States. It’s got amazing exhibits with more than 500 species of animals. 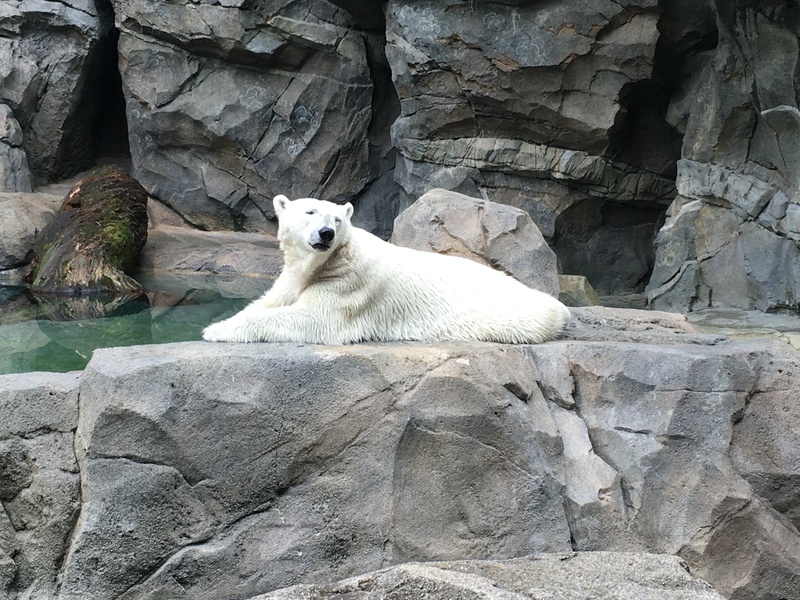 You can see polar bears swim, cheetahs run, and feed a giraffe. They were prepping their new exhibit for hippos but it wasn’t open yet when we arrived. We also didn’t get to see the cheetahs run — it was their day off. While the day started gloomy, it ended up being a beautiful day for the zoo. I’m thinking that a couple of the boys might need to go on a date to the zoo. That could be a fun story…. I hope that you’ve enjoyed my tour of Cincinnati. When we’re working on the stories for the Unbreakable Bonds series, we try to use as many real places as possible. It just makes the stories that much more fun. And don’t worry… we are hard at work on Rowe’s story – TORCH. We are hoping to have some announcements for that book very soon. We are still aiming to release the book in Autumn 2016. Right now, we’re locking down some editing services as well as some marketing. As soon as we have some dates confirmed, we will be making some announcements. EXCELLENT Tour!!! Wonderful narration and pictures. Thanks so much! It was a good visit back and gave me some new ideas for places we need to take the boys.